CoWork is modern and fresh WorePress theme for Open Office, Coworking Space & Creative Space. We made this theme fit for your service. This theme including pricing, booking room, booking office, gallery, about us, contact us, blog page and also FAQ page. It’s completed theme and ready for your Open Office & Creative Space. CoWork using unique design for each categories that help your site stand out your competitors. Visual Composer Page Builder for WordPress is drag and drop front-end and back-end page builder plugin that will save you tons of time working on the CoWork WordPress Themes. WordPress Leading favorite page builder included for free! CoWork Page Builder Elements helps you flexibility of adding, customizing and replacing your website elements. CoWork create a sub pages within a few seconds like a live demo. CoWork Can Easily Change the Appearance of Your Layout Styles with Full Width, Boxed, Left Sidebar & Right Sidebar. CoWork has 1 Pre-Designed Header styles edit logos, change colors, text styles, sizes and furthermore. CoWork help us to create 5 styles of Blog Styles. Those styles are Masonry, List, Grid, Chess, Timeline. CoWork comes with install all these amazing custom designed layouts within one click. 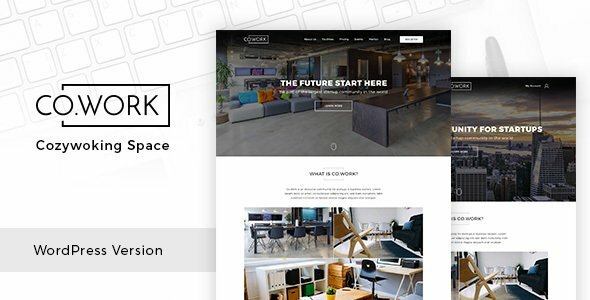 CoWork WordPress Theme comes with lot of options neatly organized into sections that allow you to build websites without any coding knowledge. CoWork is 100% responsive, each and every element are fully responsive. Weather you’re looking at mobile, tablet and desktop devices. CoWork is 100% Right To Left language supported. We have a huge number of layouts that are easy to edit. You can edit each and every sections of CoWork WordPress Theme. CoWork provides you a options about unlimited colors. All color options in Theme Options Panel. CoWork offers over 30+ widgets that can be used in sidebars and footer. You can change the positions of widgets using drag and drop. CoWork supports change the backgrounds of each sections. Type of backgrounds are colors, images and videos. CoWork is ready for translation support. This will help you to get all content in camping in your language easily. CoWork works perfectly with all available browsers like Internet Explorer 10+, Safari, Chrome, Opera and Firefox. CoWork is optimized for speed. Careful attention to detail and well structured code ensures a smooth experience. CoWork Contact Form 7 can manage multiple contact forms, plus you can customize the form and the mail contents flexibly with simple markup. CoWork is fully compatible with WooCommerce plugin to provide you with the best yet solution for e-commerce. CoWork team with always hear from your needs. So, camping will always be the first line for your needs as an updates. CoWork dedicated support team supports you solve your theme related problems timely.